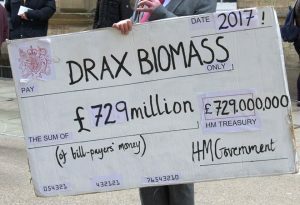 Please help us to CALL ON the government to redirect renewable energy subsidies from dirty, high-carbon biomass burning to clean, low-carbon renewables. These subsidies, granted under the Renewable Obligation, are supposed to support renewable energy and reduce carbon emissions. 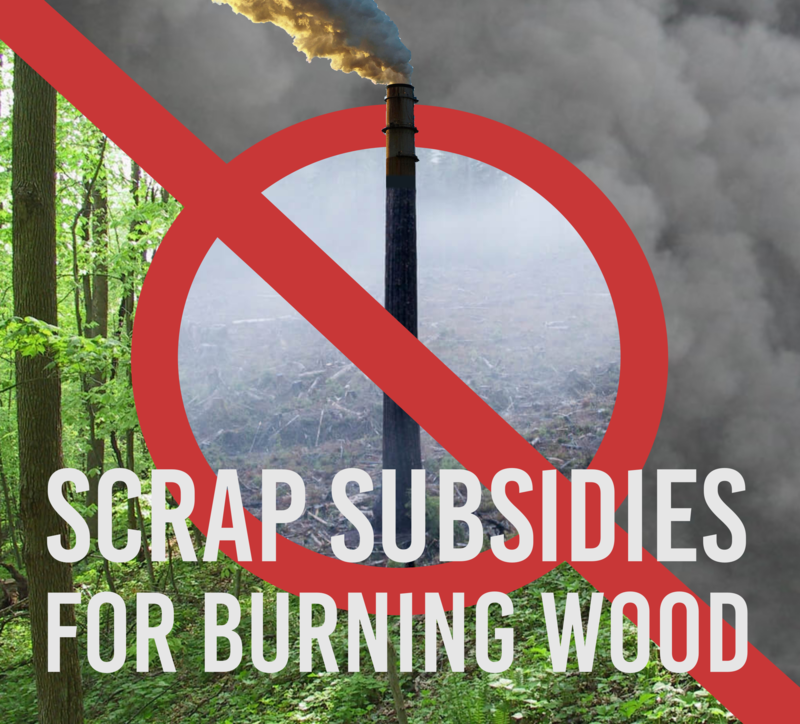 Sadly, around £1 billion of those subsidies a year support power stations that burn millions of tonnes of wood every year to make electricity. Burning wood in power stations makes climate change worse, harms forests and biodiversity, pollutes communities and wastes money on a false solution to our energy needs. While energy companies cash in on huge subsidies for high-carbon, polluting biomass energy, subsidies for new onshore wind and solar power have been scrapped and funds for home insulation have been slashed. 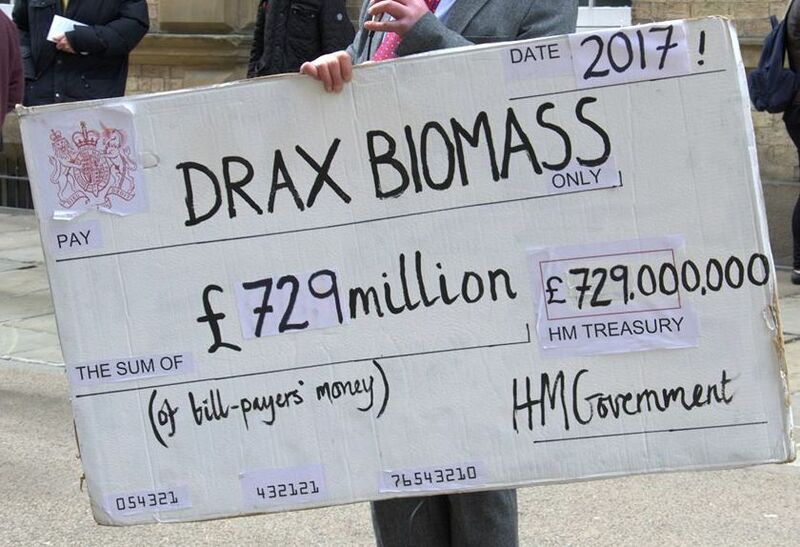 One ray of hope is that the government has just effectively ruled out future subsidy for large-scale biomass. We now need the government to apply this logic to existing biomass subsidies and Scrap Subsidies for Burning Wood. Instead, we are asking the government to redirect renewable subsidies to genuinely low-carbon, clean renewables. 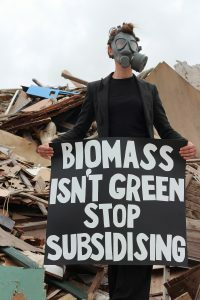 Please click here to ask your MP to call for an end to renewable subsidies for biomass. Email us at biofuelwatch[at]gmail.com if you’d like to find out more about getting involved in this important campaign. With our help you might want to …. In 2017, around £1 billion from all our electricity bills subsidised burning wood in power stations in 2017. That’s £38 per household on average. This is set to increase unless we stop it. 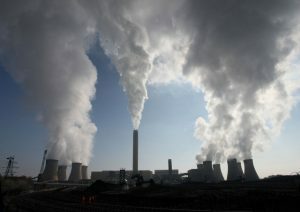 Drax power station alone received £729 million = £2 million a day or £27 per household per year. This money should be spent on energy saving and genuinely low-carbon renewables like wind, solar and tidal energy which bring more jobs, cheaper energy and long term energy security. Yet, whilst energy companies are cashing in on burning high carbon wood, subsidies for new onshore wind and solar power have been abolished and home insulation programmes have been starved of funds. Burning wood for electricity is no better for the climate than burning coal. In fact, power stations burning biomass emit even more CO2 from their smokestacks than coal power stations (per unit of energy), because biomass burning is less efficient. Even if new trees can sequester the CO2 emitted from biomass burning, this will take many decades. And climate science shows that we don’t have decades left to drastically reduce carbon emissions if we want to stand a chance of avoiding the worst impacts of climate change. All the while, forests which absorb carbon dioxide are reduced and climate warming gases are increased. In 2017, Drax alone emitted 11.7 million tonnes of CO2 from burning wood. This is more than the total amount the UK should be reducing emissions by every year to meet its carbon budgets! In 2017, Drax burned more imported wood (some 13.6 million tonnes) than the entire UK produced for all uses. While pellet companies claim to be using “residues”, photos and video footage consistently show that they are taking whole trees to meet the increasing demand. Many of the pellets burned by Drax come from the clear-felling of highly biodiverse forests in the southern US, recently designated a Global Biodiversity Hotspot. Endangered species affected by this include black bears, red wolves, many birds and the venus fly-trap, whose only native habitat is under threat. Burning trees grown on plantations, on the other hand, results in more forests and other ecosystems – as well as farmland – being converted to monocultures which many call “green deserts”. In the southern US, pine plantations are rapidly replacing the biodiverse coastal hardwood forests. 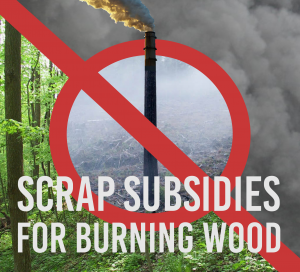 The problem isn’t simply that energy companies choose bad sources of wood. It takes far more land to generate a unit of electricity from burning biomass than it takes to generate electricity from other sources – such as wind and solar power. Even in the UK, the amount of energy per hectare from solar PV is of an order of magnitude greater than that from burning wood. There’s simply no possibility of replacing a significant amount of fossil fuels with biomass without devastating forests. For more information: please watch this I minute video about the habitats which are threatened by biomass burning. Burning wood causes similar levels of harmful air pollution as burning coal. It emits less of some pollutants (including sulphur dioxide) but more of others (including fine particulates, or PM2.5), but the overall dangers to people’s health are comparable. The toxins emitted are linked to higher rates of cancers, strokes, heart disease and respiratory disease. 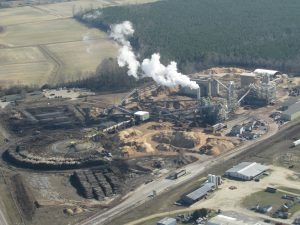 Meanwhile, communities living next to pellet mills, including in the southern USA, as well as residents living next to wood chip mills and stores, are affected by wood dust, which is linked to cancer and other diseases. These communities are often exposed to smoke and significant noise pollution as well. 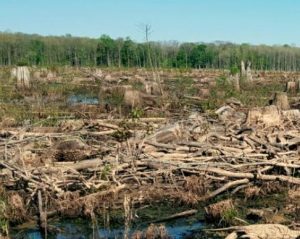 Finally, logging forests such as those in the southern US harms communities by making them more vulnerable to flooding and droughts. If we want to keep global warming to within 1.5 or even 2 degrees, we must stop burning fossil fuels as well as large-scale biomass. Instead, we need to drastically reduce our energy consumption and invest in energy conservation, energy storage and genuinely renewable wind, wave and solar power. Watch a trailer for the award-winning documentary BURNED – Are Trees the New Coal? And ask us about organising a local film showing. We will try to get a speaker along.